Simply the cleanest, freshest tasting oysters. These beauties are delicious raw, bbq'd or baked. The shellfish species raised in the Drake’s Estero by the Drakes Bay Oyster Farm is the Pacific Oyster. These shellfish continue to be produced as "singles" and sold live in-shell as well as shucked packed in various sized containers. The water temperature of Drakes Estero is too cold for the non-native oysters to spawn on their own, so they must be seeded by hand, eliminating the risk of unintended invasion. The Drakes Bay Oyster Farm produces its own shellfish seed by performing remote setting on-farm. This advanced hatchery technique allows the farm to curtail the purchasing of seed (small shellfish) from producers in other waters and thus the risk of introduction of other contaminates and non-native species. Now, the easiest way to enjoy the fresh taste of Drakes Bay Famly Family Farms is coming to your local retailer. These locally-grown delicious treats are ready for your weekend get-together or the refrigerator. Offered in Medium, Small and Extra Small sizes. Find a store near you to start enjoying delicious Drakes Bay Family Farms Oysters. See Availability. The Monterey Bay Aquarium's Seafood Watch Guide says that it is important to buy seafood that is abundant, well managed, and farmed in environmentally friendly ways. Domestically-grown and farmed oysters like thosed raised by Drakes Bay Family Farms are reccommended by the Seafood Watch Guide as "best choices" for consumers. Ordering for pickup is done with a simple phonecall. One or two days in advance of pickup is enough time to fill most orders. It is a common misconception that oysters and other types of shellfish are high in saturated fat and cholestrol. A serving of 6-8 medium oysters (3.5 oz. or 100g.) contains only 69 calories and 55 mg. of cholesterol, well within the 300 mg. daily cholesterol intake level recommended by most major health organizations." 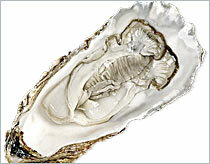 …We asked the National Heart and Lung Institute, which says oysters are an ideal food for low cholestrol diets. And they're an excellent source of vitamins A, [B.sub.1], [B.sub.2], [B.sub.3], C and D. Four or five medium-sized oysters can supply the recommended daily allowance of iron, copper, iodine, magnesium, calcium, zinc, manganese and phosphorus." —Source: Better Nutrition Magazine, January 2005 - "Nutrition Pearls"